When it comes to connectivity on the stage or in the studio, you can never have too much – and that’s where the ultra-flexible MS8000 8-Channel Microphone Splitter makes all the difference. The MS8000 provides the ideal solution for live and recording musicians who need to send signals to multiple locations, including mixing and recording consoles, In-Ear-Monitors (IEMs), floor wedges, broadcast trucks and much more. With eight Inputs and 16 Outputs, the MS8000 easily connects you to the Front of House (FOH) console – and sends duplicate signals to your choice of destination devices. The 1RU MS8000 features eight XLR Input sockets on the front panel for your mics and DI boxes, along with a LIFT/GND switch to eliminate hum or other noise from ground loops. 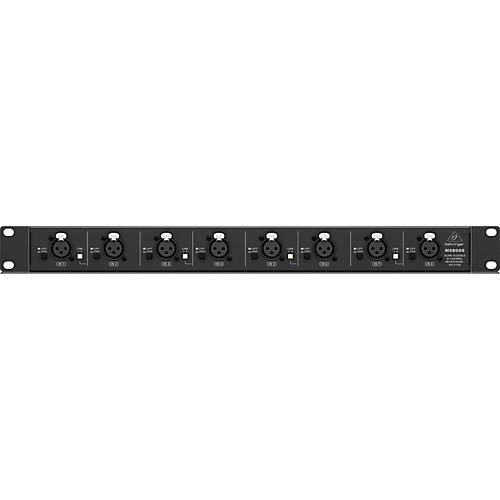 Each channel features an XLR Direct Out connector, which outputs a post-transformer copy of the input signal, and a second XLR Link Out connector sends a pre-transformer copy of the input signal. This configuration allows sending your Direct Out signals to the FOH or recording console, and the Link signals to your monitor board or phones mixer – making the MS8000 the ideal choice for both your live performances and the studio. One of the MS8000’s most innovative and powerful features is its Input Link functionality. By simply pressing the Link switch you can connect 2 adjacent channels, doubling the output possibilities of the common input signal. Now with a source connected to Channel 1, you can send signals from the Channel 1 Outputs to the FOH and monitor systems – and the same signals via the Channel 2 Outputs to your recording interface and broadcast mixer simultaneously. Conversely, two adjacent channels can be linked to merge their source signals into one output creating a sort of passive mixer. This configuration would be ideal for managing multiple playback devices for performance tracks, or converting stereo instruments to mono output. Since the MS8000 is a passive device, volume would need to be controlled at the source devices. If your production calls for condenser microphones or active DI boxes, the highly versatile MS8000 has your phantom power needs covered. All of MS8000’s channel Link Out XLR connectors allow your mixer or mic preamp to pass available phantom power to the XLR In connectors – and on to your devices, ensuring optimal performance. The incredibly-flexible MS8000 is a vitally-functional tool every audio engineer or band should have in their toolkit. Whether you use it to feed your monitor system, FOH or recording console, or broadcast and recording interface, the MS8000 is worth its weight in gold – and it’s so affordable.